The Economist has a profile of Rosneft CEO Igor Sechin - Igor Sechin, head of Rosneft, is powerful as never before. “HELLO, you’ve called Rosneft,” goes a joke making the rounds in Moscow. 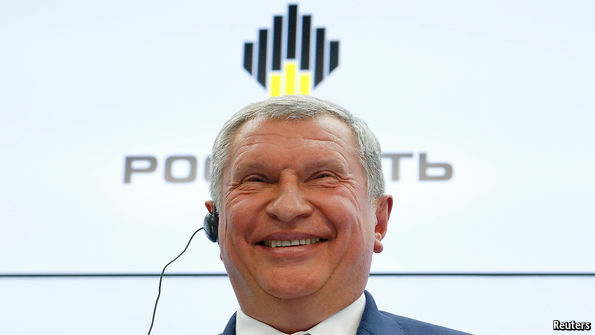 “If you have an oil asset and you don’t plan to sell, press the hash key.” The Russian word for hash key, reshetka, also means “bars”, as in jail—where those who cross Rosneft’s head, Igor Sechin, tend to land. Mr Sechin is one of the most feared men in Russia and an essential instrument of Vladimir Putin’s power. A major player among the siloviki (former and current members of the security services), he epitomises Russia’s nexus between political power and property. Despite being a target of American sanctions, earlier this month he succeeded in selling a 19.5% stake in Rosneft to Glencore, a commodities firm, and the Qatar Investment Fund, raising $11bn. The deal, the biggest foreign investment in Russia since the start of the Ukraine crisis in 2014, pleased the Kremlin no end. “Putin needs that like he needs air,” says Olga Kryshtanovskaya, a sociologist who studies the Russian elite. Another boost to Mr Sechin’s prestige came with the nomination of Rex Tillerson, the boss of ExxonMobil, as America’s secretary of state. The two men’s long relationship was consummated by the deal they struck in 2011 for their firms to work jointly in the Arctic. Mr Sechin is now poised to become an intermediary between Moscow and Washington.